Maybe something to do with the long week-end and New years, but what ever, it was great to see the increased participation for this FMT. We had several first timers including Carl, KC4FLT, who just happened to hear my "call up" on 40 meters and was able to participate (a real Sudden FMT hi hi). If your an FMT-nut, conditions don't get much better than winter time, at the bottom of the Sun Spot Cycle. There was at least one sub 10 mHz reading on all bands, with several on most bands. AA4RP GA Strong signals on 80m and 40m. Very weak on WC with heavy QRM. Didn't try 20m. AB9CA AL Since I have only a crude setup can come no closer than 1 Hz, if that. Was having some problems early so have more confidence in 40m than 80. Was not able to make the 20m run. Thanks for the test. Certainly is interesting to give it a try. AF9A IN Connie, signals were S6 to S7 on 40 and 80. W6OQI peaked about S3. Pretty rough. Thanks! K1GGI EMA Local reference is the 10MHz in an HP 8594E that gets disciplined (by me) to the 5930 Loran-C GRI from Nantucket (30 miles). Method uses an HP 8640B tuned about 1kHz below signal, detect am, analyze beat with SpectrumLab. Dispersion ran around .2 to .3 Hz, tighter on 80, west 80 was spread over 1/2 Hz. West 20m run looked about 1/4 Hz higher here. K5CM OK Marvin, noise was high on 80 but had no problem coping your signal. K6OQK LAX I saw quite a bit of Doppler on Connie's 80 and 40-Meter evening signals. Marv's signal from 8 miles away was a bit weaker than normal. I probably should've rounded my readings off but this was what my instrumentation and math came up with so here it is. I like the new entry form. Connie - Thanks for the great FMT's and to Pam for the loan of you. K6YAZ LAX Missed afternoon test. Marvin's signal surprisingly weak on 80. K8EHB OH ICOM 746 w/ indoor antenna. KB8MOU OH WC-80m was weak in Ohio and seemed to change freq a bit on my end. KD2BD NNJ Great signal into New Jersey on 80-meters, Connie. Thanks for the "Sudden FMT"! KE2N VA My first try at making an entry. I did something (different) wrong on each band, but thought I would see how wrong. Next time I will try for one more decimal point. Setup is a Z3801 and PTS310 injecting thru a directional coupler into an old IC765. Frequency readout on SpectrumLab, using a free-running motherboard soundcard in a brand-X PC..
N2CUA WNY Better Signal on 20 Meters then 80, Couldn't hear you on 40 Meters at all .. Heard The west coast station on 80 meters, but too much QSB. N8OB OH WOW! I spent most of the day trying to get my computer working correctly and so missed the first 2 freqs and couldn't hear the WC at all. I also was trying a new technique. VE2AZX QC No copy on 40m. Not sure about the WC-80m ! Excellent sig on 20m and 80m. Thanks. W0CNN CO Was only home for the 20M test. 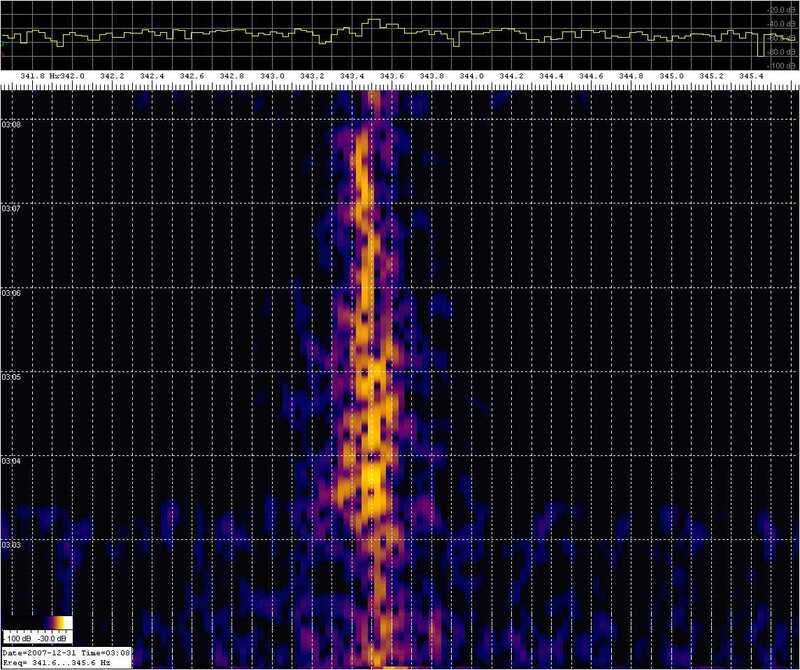 Got good signals on both East and West beam of 20M FMT- .1 Hz doppler shift between two. 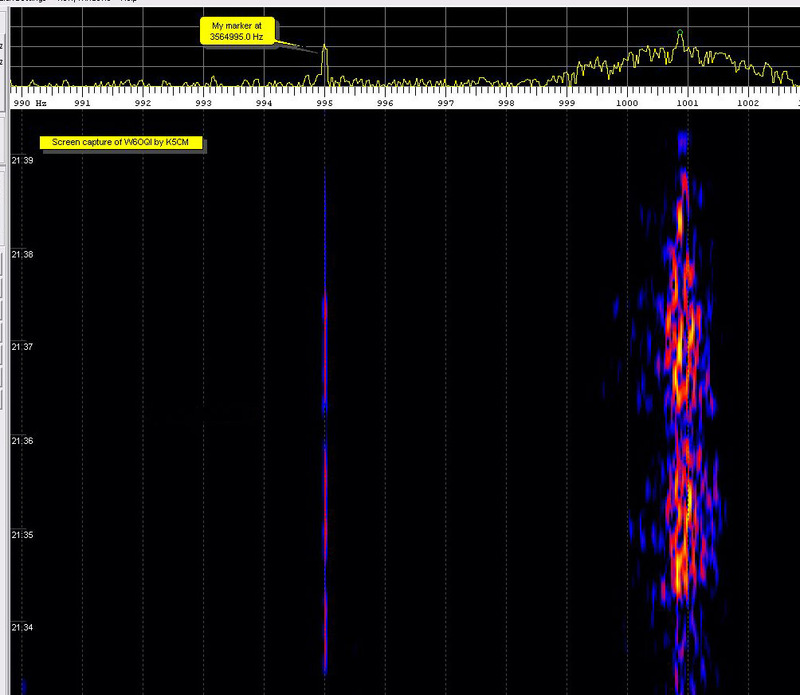 No QRM, good steady signal.Thanks again Connie for another fun FMT test! W0PHD MN was gone for the 20 mtr test 80 meter sigs were good WC was weaker but ok 40 mtr was buried in noise at times. W3CSW MDC Only S2 on 20 meters but little Doppler. W3JW VA 20M Signal was medium readable with significant QSB---40 and 80 M sigs were good readable--- the 80M signals had the most noticeable Doppler spread at this QTH---Happy New Year and good measuring to all in 2008! W6IHG VA Just ran quick dial corrections (way different then in Nov). Strong S6 signal in VA. Noticed lots of cyclic beats on the signals. Due to sunset? W6OQI LAX Best signal was 20 meters followed by 80 meters and then 40 meters. 40 meters was strong enough for measuring even though not as good as the other signals. W8GF MI Connie: Propagation here on 80 was marginal and non-existent on 40. 80 Meter readings are suspect because two carriers blanked the test signal with nearly equal strength. W9TJ IL I screwed up the data files so the submitted freqs were taken during the CW callups. The setup is the same I used in the ARRL test. Measurements submitted were not taken during the official measuring interval. They went by-by with the old man's fumble fingers. WA1ABI RI Tnx for the many FB FMT's in 2007 Connie and Marvin. Happy New Year & 73 to all. *Burt is 8 miles from Marvin and can copy his ground wave most times. A HP-Z3801 GPS clocks a HP-3336B and a PTS-250. A small 10 db transistor amp follows and drives a 12BY7 / pair 6146. Then to the final amplifier, a Dentron 2500 or Drake L4B at 300 watts output. There are no mixers or any device in the chain of amplifiers that might impact the accuracy of the HP-Z3801. As a reality check, I periodically log the HP-Z3801 against WWVB. I monitor each transmission with a completely separate receive system to look for any instability or short term drift. The separate system is not locked to the GPS but calibrated by the GPS system before the FMT.